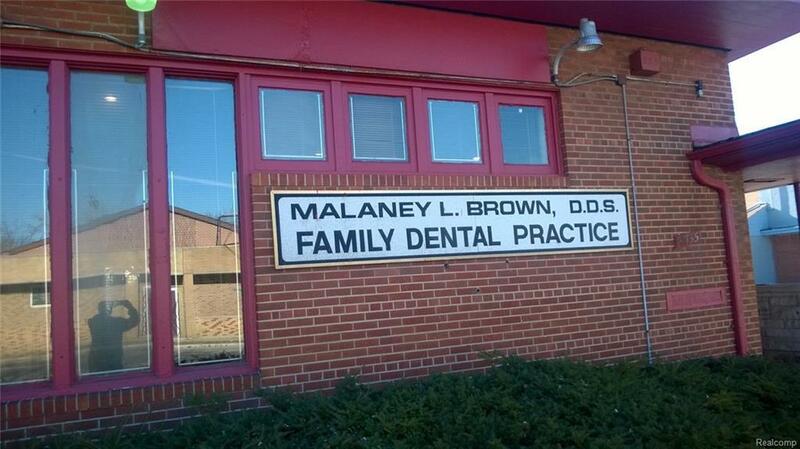 TURNKEY DENTAL /MEDICAL OFFICE! THE BLDG OFFERS, A LARGE RECEPTION AREA TO ACCOMMODATE SEATING FOR A LARGE MEDICAL PRACTICE OR MULTIPLE MEDICAL PROFESSIONALS. A LARGE BUSINESS OFFICE AND RECORDS ROOM, 4 MEDICAL EXAM/OPER ROOMS, X-RAY ROOM, LAB, PRIVATE OFFICE, SEPARATE AREA ACCOMMODATE STAFF BREAKS, 2 RESTRMS ONE FOR THE PATIENTS AND OR CUSTOMERS AND ONE FOR THE STAFF. THIS IS AN ESTABLISHED OFFICE WITH OVER 30 YEARS OF HISTORY IN THIS COMMUNITY. LOCATED IN AN ESTABLISHED THRIVING, FAMILY ORIENTED COMMUNITY. RENOVATE TO SUITE! THE POSSIBILITIES FOR THIS BLDG ARE ENDLESS! DON'T NEED A DENTAL OFFICE, SOME OTHER POSSIBLE USES: LIFE, HOME, AND AUTO INSURANCE OFFICE, DURABLE MEDICAL EQUIPMENT, BUSINESS THINK TANK AND/OR MEETING SPACE FOR NEW UPSTARTS, REAL ESTATE OFFICE. THE LOCATION OFFERS EXCELLENT VISIBILITY. IN 2017, THE ROOF WAS RESTORED AND THE EXTERIOR OF THE BLDG WAS PAINTED. CALL FOR AN APPOINTMENT OR FOR MORE INFORMATION. INVEST IN THIS GEM NOW! BE A PART OF DETROIT'S COMEBACK!